Who doesn't love Christmas? It inspires even the most uncreative person to want to be more like Martha Stewart. Unfortunately, we all don't all have Martha's talents. If you, my friend, are one of those people then this is the craft for you. The monogrammed ornaments are classic and easy to make. They're nice for your tree or for a little gift for the special people in your life. I made these for my best friend's two daughters. I bought two boxes of glass ball ornaments, red and teal. (Teal because we're all big Jaguar fans here- even though they're horrible!) The paint, ribbon, and paint pen I used to make it I already had on hand. First, I painted on the white dots using acrylic paint. I had a round sponge paint brush on hand and dipped that in the paint and stamped it on the ornament, then filled it in with a brush. You could always just paint the circles free hand too. 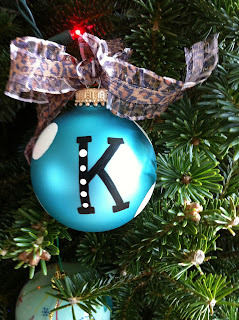 Then I used the paint pen to free hand the letter monogram. I added some white dot details to the letters using the other end of a paint brush dipped in the paint. Finally, tie on your favorite ribbon to finish off whatever look you're going for. That's it. How's that for easy peasy?